New Jersey Regenerative Institute has officially gained IRB approval for their Regenerative Outcomes Database from the Institutional Review Board at the Institute for Regenerative and Cellular Medicine based in Santa Monica, California. Our physicians are now conducting IRB certified research studies and are looking for volunteers with specific orthopedic conditions. Study subjects will receive these various treatments at a significantly reduced rate. Drs. Gerard Malanga and Jay Bowen of New Jersey Regenerative Institute recently expanded their practice by collaborating with Kessler Institute for Rehabilitation, a leading inpatient and outpatient therapy center based in West Orange, NJ. In doing so, the doctors are making non-surgical regenerative treatments, such as PRP (Platelet Rich Plasma), Lipogems® (adipose/fat tissue), BMAC (Stem Cell) and Oxygen Ozone Therapy, available to disabled patients who are unable to undergo surgery due to spinal cord injuries, neurological/cardiac conditions and strokes. On August 25, 2017, Drs. 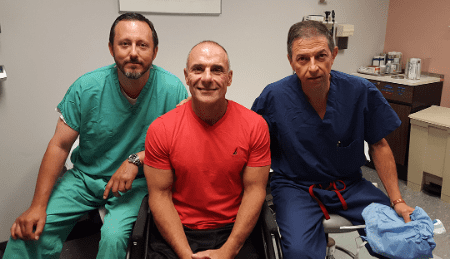 Malanga and Bowen performed their first regenerative procedure on a patient with a spinal cord injury who was suffering from a torn rotator cuff. Due to the patient being wheelchair dependent and not able to undergo surgery because of health risks, Lipogems was performed which entailed a local anesthetic and the use of autologous (the patient’s own body) adipose tissue with an FDA-approved device specifically for breaking down fat cells for re-injection. Since there is no anesthesia involved and the fat tissue is taken directly from the patient’s body, the procedure is extremely low risk with no chance of the patient’s body rejecting it. New Jersey Regenerative Institute’s physicians and staff are proud to be working with Kessler Institute and the disabled populations who are in need of regenerative treatments to regain basic functionality and improve their quality of life. If you would like more information or are interested in this research study, please contact us or contact the Kessler Institute for Rehabilitation at 973-731-3600. Join us to improve your health and others. We thank you in advance for your participation. Breaking News: Derfner Foundation funds novel research in regenerative medicine at Kessler Foundation to support a study of a new intervention for shoulder pain in wheelchair users under the leadership of Drs. Dyson-Hudson and Gerard Malanga.